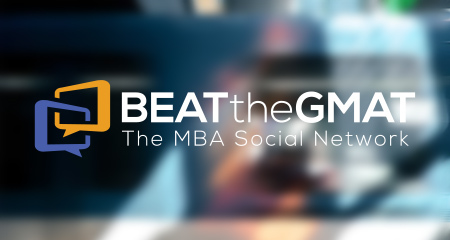 A strong performance on the GMAT is a key component of the MBA application to most top business schools. But what can you do if your score is not where you want or need it to be? Any number of factors could have thrown off your game, from illness to test anxiety to insufficient preparation. The first step is to make peace with the fact that taking the test twice or even three times is completely normal. In fact, this dedication to improving your score is often interpreted by the admissions committee as a sign that you’ll do whatever it takes to prove you’re ready for business school. If the issue is not being prepared enough, ramp up your studying, take a class or consider hiring a tutor who can help you streamline your efforts and teach you the best methods for answering the various question types. However, if you do find that your score hasn’t improved significantly despite two or more attempts, don’t beat yourself up over it. Your energy would be better spent taking a broader look at your entire application strategy. While it’s natural to become hung up on achieving the highest score possible, or fixate on the average GMAT score reported by the schools, I urge test-challenged clients to focus instead on aligning their scores within the 80 percent range. Many schools list this information directly within their class profiles. For example, the 80 percent range for the MBA class entering UC—Berkeley’s Haas School of Business in fall 2013 is 680-750. At Columbia Business School, the MBA class entering in 2012 had an 80 percent range of 680-760, and University of Pennsylvania’s Wharton School lists the 80 percent range as 690-760 for the class of 2015. Targeting these numbers at the lower end, rather than at the out-of-reach average, may keep your application viable. However, if you’re 50 points away, it’s time to rethink your selected programs and consider adding options in the top 20 or 30. You can still leave the highest-ranked options on the table, but these have officially become what we call “reach” schools. When a client is really dissatisfied with their GMAT score, sometimes the best option is to think way out of the box. Jamie came to us with rock-solid work experience, a lengthy history of international exposure and interests and stellar extracurricular activities. Unfortunately, she couldn’t get her GMAT score to cooperate. Her highest score was a 600, and to make matters worse, her quantitative percentile hovered around 40, which was about half of the target score at Harvard Business School, Jamie’s first-choice program. Although we’ve seen schools take risks on very strong clients who happened to have a low GMAT score, we decided Jamie should take the GRE and see how the two scores stacked up. In the end, her overall performance with the GRE was actually lower. But interestingly, her score was balanced toward a much stronger performance in the quant section, which made a compelling argument for submitting the GRE instead of the GMAT. This tactic proved successful. An ecstatic Jamie was admitted to Harvard, and didn’t give a second thought to the three back-up schools she had added to her list. The GMAT score foretells how well one would do in the core academic courses of an MBA program, but isn’t a predictor of success throughout the entire b-school experience. This is why most schools have a holistic approach to considering each application. It’s entirely possible to offset a low GMAT score with a proven track record in a quantitative job, a high GPA from a respected undergraduate school and compelling extracurricular or leadership activities. Put your energies toward boosting your candidacy in the areas of your application you can control, namely the essays, extracurriculars and, to some extent, the recommendation letters, where your recommenders can highlight your quantitative skills. Although you may feel tempted to use the optional essay to explain a low test score, try to resist, as this will likely come across as making excuses rather than providing additional information. In the end, your exceptional accomplishments will likely shine through despite some academic challenges. The admissions process is a complex one, so after you’ve done the best you can on the GMAT, it’s time to focus on developing your personal brand by packaging your goals, passions, work experience and “why business school, why now” into a compelling case for your admission. If you are looking for guidance on your MBA application, Stacy Blackman Consulting can help with hourly and comprehensive consulting services. Contact us to learn more. If you liked this article, let Stacy Blackman know by clicking Like. The author Stacy Blackman gets email notifications for all questions or replies to this post.